I am such a spring girl. I love when the weather starts getting warmer, and the first day you can go outside without a jacket and not regret it. The thermometer on my deck says 58 degrees, but it feels so much warmer! 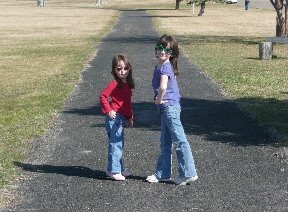 I walked the girls to the park after Hallie got home from school, and in my long-sleeved black tee I was too warm! They not only went to the park, they are now playing in the back yard while they wait for dinner. They found a whole bunch of daffodils coming up in the back yard. That’s one of the interesting things about moving as often as we do – we get to enjoy the true surprise of spring flowers without having to do any of the work of planting them. Those of you who’ve lost your stitching mojo, I hope you found it, or at least are enjoying your share of mine! It was all I could do yesterday and today to cross any xs. Last night once the kids were in bed I couldn’t make myself do any work. I took the night off and watched tv. The only thing I felt like stitching this afternoon was Lizzie*Kate, and I’m glad I did. I’ve nearly completed the Lizzie*Kate portion of the project. This is one of those gifts I can’t tell you about, so don’t bother asking. I will get to Emma tonight after Bible study, and start on her roses. Did I mention that my stitching lamp died? It did! It was a torchiere with a task light. The upper portion did not survive this last move (well, the shade didn’t, and we couldn’t replace it). Then a couple of weeks ago the task light shade started cracking and melting! So the little “banker’s lamp” from my desk is sitting next to my chaise, positioned so that I’m sure it blinds people sitting on the couch, but oh well. I have another floor lamp in the garage. It is waiting for a coat of black spray paint before it will be fit to stand in my living room. Sending some Idaho sunshine your way! Enjoy!